Summer movie night just got a lot cooler . . . and tastier thanks to Mars Ice Cream! 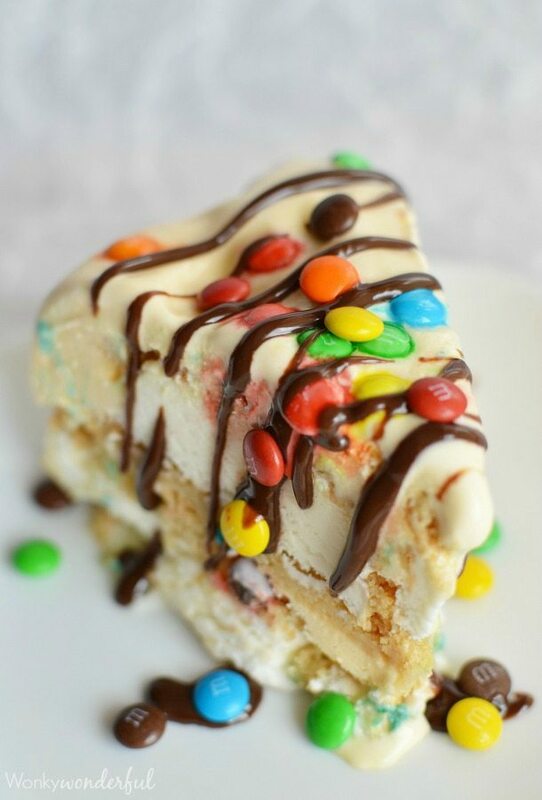 Enjoy these tasty treats right out of the package or make this M&M Cookie Ice Cream Cake. Warning: This may just be the easiest and most delicious summertime dessert EVER! Enter the GIVEAWAY below for your chance to win Mars Ice Cream products. Mars has a variety of real ice cream treats to sweeten your summer: DOVEBAR® Ice Cream Bars, M&M’S® Brand Ice Cream Cookie Sandwich, SNICKERS® Brand Chocolate Ice Cream Bars and TWIX® Ice Cream Bars. 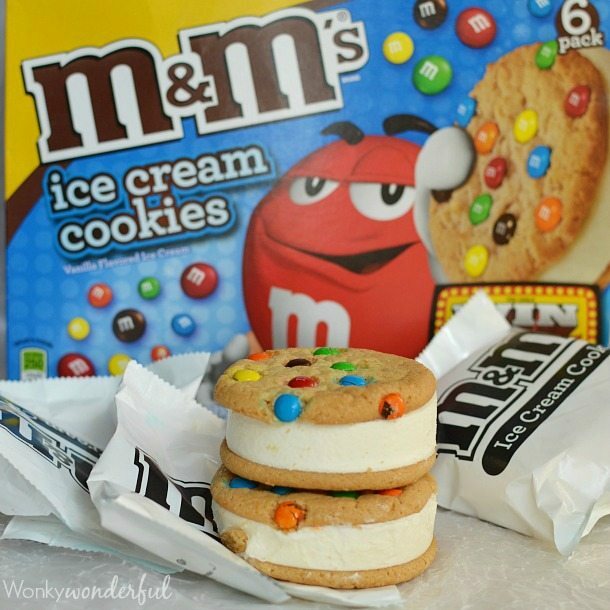 I’m all about the M&M’S® Brand Ice Cream Cookie Sandwich. Cookies, Ice Cream AND M&M’s!?!?! What more could a girl want? Which Mars REAL Ice Cream Treat is your favorite? My daughter and I snacked on M&M’S® Brand Ice Cream Cookie Sandwiches while we watched the movie Monster Squad. Remember that gem? It is an 80’s cinema classic! 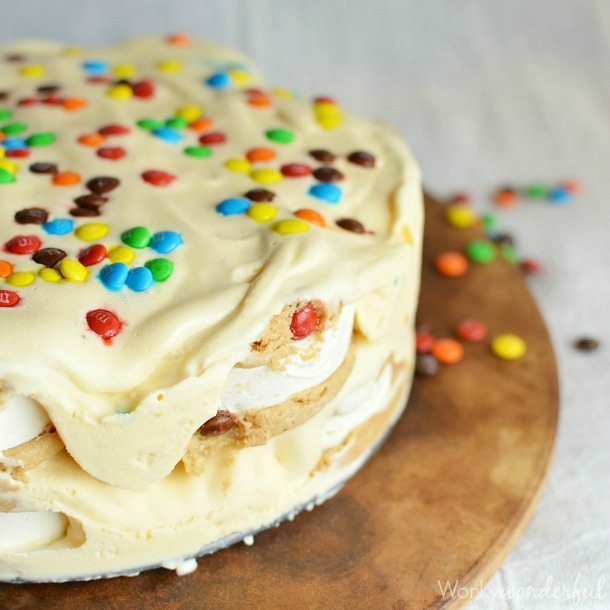 This M&M Cookie Ice Cream Cake would be great for movie night or even a birthday party. Make your own Birthday Ice Cream Cake for about $15!!! No baking involved! And it is super-duper easy to make. 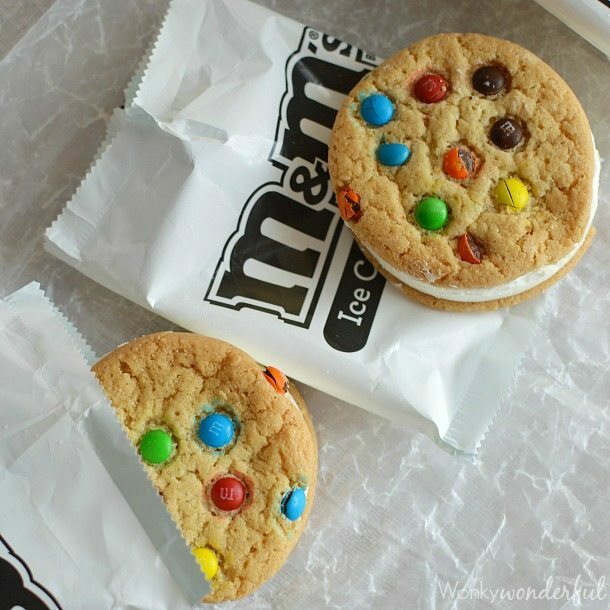 Just layer the M&M’S® Brand Ice Cream Cookie Sandwiches and vanilla ice cream (or chocolate). Top with M&M’s and freeze. Slice and serve with hot fudge sauce, whipped cream and extra M&M’s. I made this quick video to show how simple it really is. Warning: This video contains light background music. Pick up some Mars Ice Cream treats for your next family movie night. Unlike “imitation” ice cream products, Mars Ice Cream combines delicious, REAL ice cream with the candy brands you know and love. 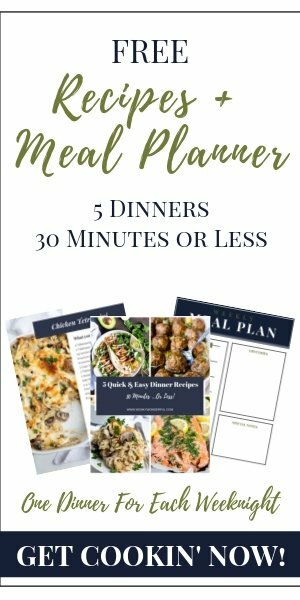 Enter the giveaway below and then check out the recipe at the bottom of this post. Enjoy! Allow ice cream to soften. Smear half the ice cream over the top. Layer 6-7 more M&M’S® Brand Ice Cream Cookie Sandwiches. Spread the remaining ice cream over the top. Sprinkle M&M's Minis over the top. Freeze 3+ hours until solid. To remove from spring form; run a warm washrag around the outside of the spring form sides. Slice and serve with hot fudge, whipped cream and more M&M's Minis. My youngest stepson keeps wanting ice cream cookie cake year after year. I was so happy to find this because it seemed EASY and nearly guaranteed to please. Just made it for his birthday and it was an amazing success. Thank you for sharing this and making my life so much easier!!!! !